AccuBlue® High Sensitivity dsDNA Quantitation Assay is a safer fluorescent dsDNA quantitation assay for microplate reader. The assay uses non-toxic, non-mutagenic EvaGreen® dye (download the EvaGreen Safety Report for more information). Featuring our unique AccuBlue® High Sensitivity Enhancer, the assay provides highly sensitive and selective detection of purified dsDNA samples with excellent linearity. The kits include calf thymus dsDNA standards, and provide sufficient reagents to perform 200 assays (trial size) or 1000 assays (regular size) based on a 96-well microplate format. AccuBlue® High Sensitivity solution components also are available without standards (catalog no. 31008), for customers who wish to use their own DNA standards. 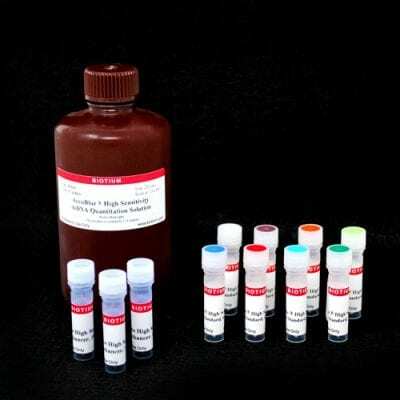 The assay is compatible with microplate readers, spectrofluorometers and hand-held minifluorometers. Note that while the assay is spectrally compatible with Qubit® fluorometers from Thermo Fisher, it may not be compatible with the high sensitivity dsDNA program on all Qubit® models (see our DNA Quantitation FAQs for more information). For the Qubit® we recommend our AccuGreen™ High Sensitivity Kit (catalog no. 31066), which was specially formulated for that instrument. The AccuBlue® High Sensitivity dsDNA Quantitation Solution offers sensitive and selective detection of purified dsDNA samples with minimal effects from common contaminants. The solution is intended for use on a fluorecent plate reader in a 96-well microplate format.